Our mothers' group welcomed its 16th baby last week! We have 11 two year olds and now five babies 10 months and younger. Little Arabella was the first girl after a string of boys, in fact until she was born all of the 'second' babies have been boys. We usually give the new babies a cot linen set or sleeping bag made by one of the very talented mums in our group. But as she is heavily pregnant with her own 'baby #2', I put my hand up to make Arabella's gift. I decided on a little dress - the O+S birthday party dress. Yes, I have made it before (three times, in fact) but I think it is just so beautiful and a bit special. I'm also so familiar with the construction now that it is very fast to make up, I didn't need to refer to the directions. 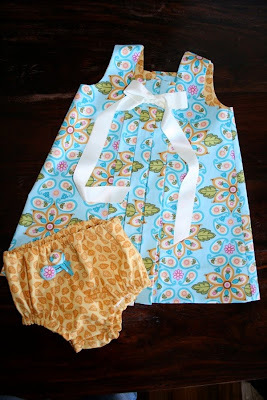 I also made a pair of matching bloomers using Lotta Jansdotter's pattern, and some matching button snap clips. 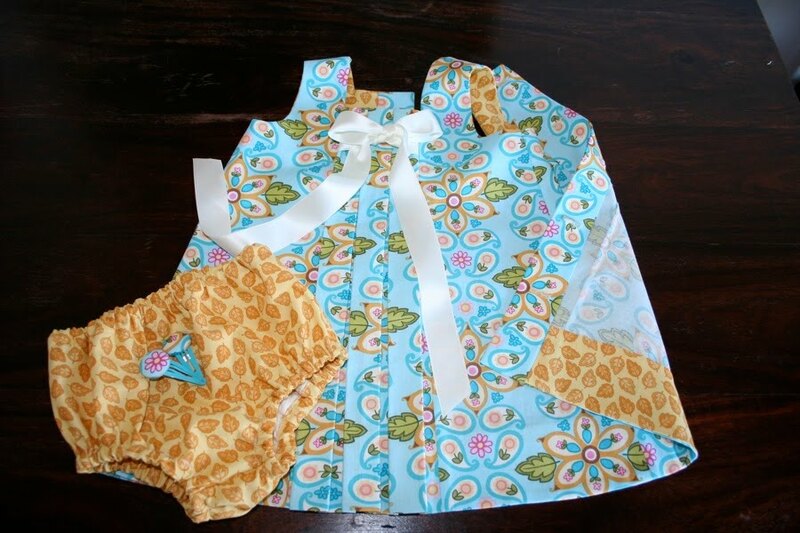 The dress and bloomers are both in size 6-12 months. As I mentioned above, this is the fourth time I've made this dress so I decided to do a few things differently to relieve the boredom. First of all, I used French seams rather than overlocking. I only learnt how to make French seams on my last project, so these and still a bit of a novelty to me and I love them! Seriously, they look so neat and I really like that I'm able to finish the seams as I sew. The pattern is pretty well suited to this method of finishing, although I did have to improvise a little when attaching the top facing, which calls for the seams to be opened out. The second thing I did differently was to use a different/coordinating fabric for the facings. I really love this look and to be honest it never would have occurred to me to do it when I first started sewing last year. 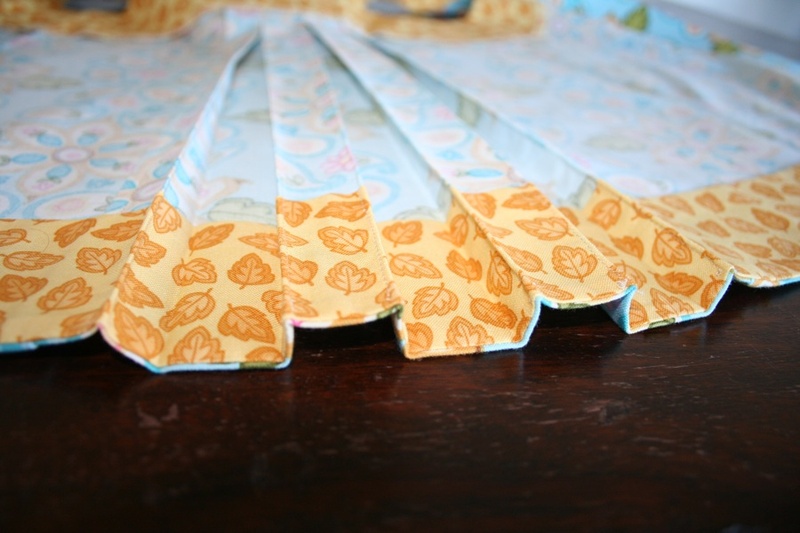 The fabric is from Lila Tueller's Soiree range. 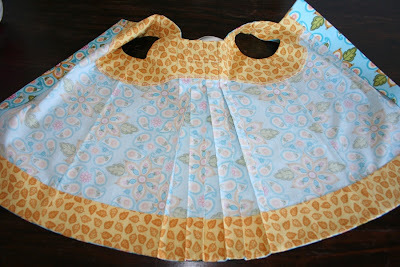 I used Meadow Paisley in Aqua for the dress and Leaf Confetti in Sun for the facings and bloomers. Both were fabrics I already had in my stash. I was worried they'd be a little busy but think they look pretty good. Finally, I sewed the pleats in this time round (using a narrow line of stitching at the inner edge of each pleat) and really love the result, it's so crisp and will be much easier to iron. I have no idea why I haven't done this in the past, but will certainly do it from now on. The finished gift: dress, bloomers and matching snap clips. The bloomers match the dress's facings. I secured the pleats with an edgestitch on the inside of each pleat. Really love the crisp finish. The inside of the dress. My overlocker may gather dust now that I have discovered the beauty of French seams. It makes the dress look so neat and professional. what a fantastic job you have done. What a lucky little girl. I have yet to break out that pattern but might look at French seams for it too - I love it when things look neat inside too. Oh, I so wish I had seen this before I made Lucy's dress!! Next time! Hi there--I know this is old, but I found this through the forums on Oliver and S. I'm sewing a birthday party dress for a wedding in silk dupioni, and I wanted to use french seams because of how badly this stuff ravels. So here's my question-- you opened up the seam for the facing, right? So did you then finish those seams in some way, like with a zigzag? I'll ask on the forum too, to see if anyone has a suggestion. THanks! Without much comparison and further ado, shoptwinkie.com believes that the things that impress our babies could possibly be the same toddler items that could impress yours. The things we sell online are the same gift items we give our babies and we truly understand what it means to amaze a baby. We have a long list of these beautiful new baby gift baskets that you will surely love to buy.